After touring London, Bath, and Stonehenge we didn't think we would see anything much better and I'm happy to say we were very wrong. After chasing away sheep, getting whipped by the wind, and having multiple detours we finally arrived at this gem, Powerscourt Estate. Powerscourt Estate was originally a 13-century castle owned by a man with the last name of "La Poer" which was anglicized into Power. In the 16th century, the Powerscourt family obtained ownership and commissioned Richard Cassels to remodel the home. The home was used over the centuries as a strategic military spot, a venue for many parties and gatherings, and even welcomed King George IV. Powerscourt had a destructive fire that essentially ruined the inside of the home with the shell of the house still standing. In 1961 the Slazenger family, of Slazenger golf, acquired the home and today it is a fantastic tourist attraction, golf course, and spa. For garden lovers this is your true paradise. There is a mix of almost every tree, shrub, and flower imaginable. 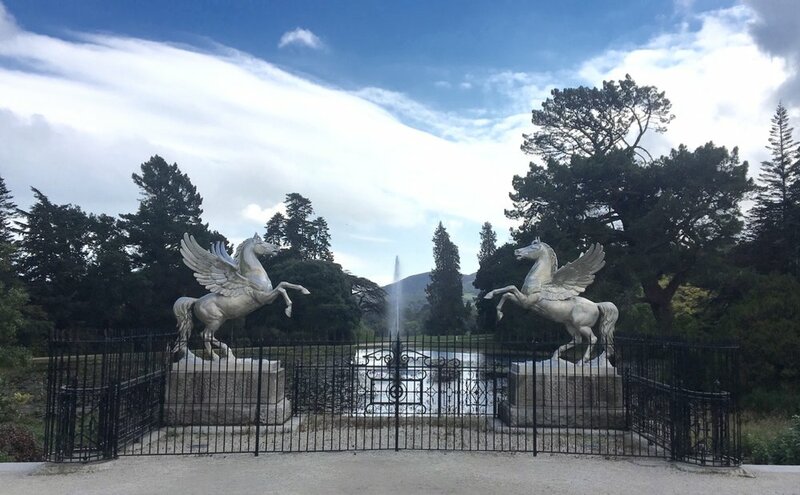 Powerscourt gardens has a mix of Eastern and Western shrubbery as well as a lake, many statues, and multiple walkways. Powerscourt is rated by National Geographic as the Number 3 spot in the World's Top Ten Gardens.